The First Communion ceremony is a special Mass that is held in honor of the participants, usually children between the ages of 7 and 8, who will be receiving the Eucharist, or Communion, for the first time. During the Communion ceremony, the children will typically leave their pews and form two lines. They will proceed up to the priest or catechist, who is specially ordained to hand out Communion, and "receive" the Communion, which by this time has been turned into the "Body of Christ." When receiving Communion, the children will either fold their hands on top of one another and bring them up to receive the Eucharist or they will open their mouths, allowing the priest to place the Eucharist. During the ceremony, most of the readings that would traditionally be done by a lecturn during a Catholic Mass will be done by a few of the children. The children celebrating their First Communion will be the first of the congregation to receive the sacrament. 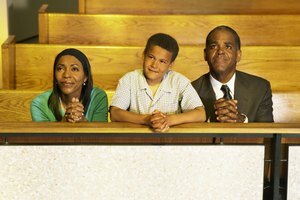 They will proceed back to their pews, where they will make the sign of the cross before kneeling below their seats to reflect and pray. After the ceremony, a large party is typically held in the celebrants' honors. 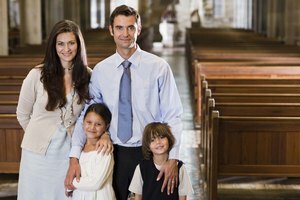 Much like a birthday party, a First Communion celebration will usually involve cake and presents, though they are usually gifts of a religious nature, such as rosaries and Bibles. First Communion is also known as the sacrament of the Eucharist, which is the second of seven sacraments recognized by the Catholic Church. 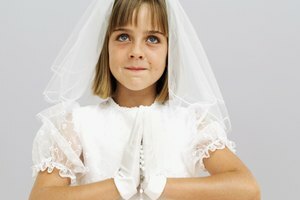 The First Communion is supposed to symbolize a child's willingness to accept the body and blood of Jesus Christ. This happens after the priest blesses special wafers and wine during a process called transubstantiation, in which the wafers and wine are metaphorically turned into the body and blood of Christ. After this happens, the child is offered Christ's body and blood and must "accept" them by ingesting them. After receiving the Communion, the children are said to be "communicants" of Jesus and his teachings, namely Catholicism. People receiving their First Communion almost always wear white, which symbolizes purity. For girls, this means veils and all-white dresses that are usually adorned with beads, pearls, lace or silk. For boys, this means white suits, or at least a white suit jacket or vest. Some adults and older children receiving their First Communions often relax this tradition a bit, opting for an off-white dress or an ensemble with a white accent. Day, Nellie. "How Does a First Communion Ceremony Go?" 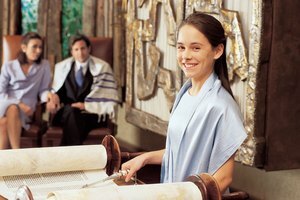 Synonym, https://classroom.synonym.com/how-does-a-first-communion-ceremony-go-12078551.html. 29 September 2017.